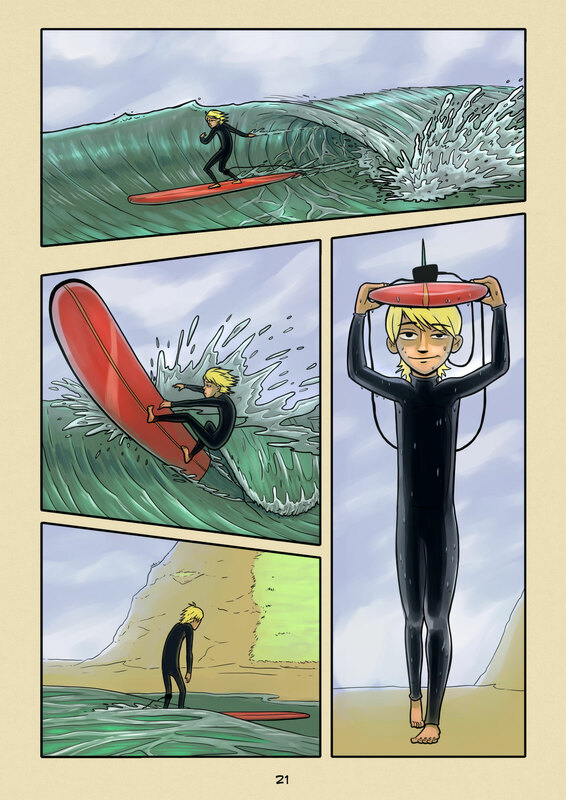 Last One In (#021) | Web comic "Surfer Joe"
Nothing beats getting the last one in at the end of a great session. Your paddling muscles are burning, energy is spent. But you’re totally relaxed. Fun waves have been on tap all day. You decide to call it a session and catch the last one in. You ride it in all the way to the beach. Perfection. The tone for the rest of your day is set. Of course when it’s good it can be hard to call it a day. I can’t count how many times I caught what I told myself was the last wave, only to be super stoked by the ride. I’ll paddle out again, “Just one more.” An hour and a half later and I’m still out there. When everything clicks, few things are as addictive as surfing. The amount of work and practice it takes is pretty staggering. And this can be off putting for most. But if it were easy then everyone would do it. All I can say is it’s worth it. The adrenaline rush of dancing on water is pure bliss, seriously. Sometimes I find the surfer’s reputation for laziness amusing. Surfers work hard, at least at surfing. It is a sport that demands a lot from those who participate in it, to the point that most other things in life become secondary. To the outsider can seem like a waste of time. Wave riding is play after all. You could argue there is nothing to gain long term from surfing(well… other than incredible fitness level). But maybe long term thinking is overrated. You can’t always work towards what will make you happy tomorrow, or you’ll never be happy today.